Are you looking for the ultimate gloss enhancer for a deep, wet, bright shine on white, silver or any light color paint? Are you tired of every product seemingly being geared towards black or red paint? If the answer is yes to these questions, the Chemical Guys White Light Hybrid Radiant Finish is for you. White Light is a premium gloss enhancer and sealant all in one! Use White Light to add a layer of deep wet shine, fill minor swirls and scratches, and clean minor stains and imperfections from the surface. Micro-refined oils fill in light swirls, scratches, and defects, reducing their visibility for a more lustrous shine. The specialty formulated gloss enhancers brighten and enhance the appearance on any color paintwork, however it really makes white, pearl, silver, gray and other light color paint finishes pop! After application, White Light will protect paintwork against pollution, brake dust, industrial fallout, water spots, and harmful UV rays. If you are looking to clean, enhance, and protect your light colored paint all in one step, the Chemical Guys White Light Hybrid Radiant Finish is your answer! If you have a dark colored car (i.e. black, blue, etc. ), take a look at the Chemical Guys Black Light Hybrid Radiant Finish. White Light proved to be an easy to use product that left the vehicle looking nice and glossy. WHITE LIGHT Hybrid Radiant Finish is for enthusiasts who want the deepest. sharpest, wettest, and brightest reflection imaginable. White Light is a premium hybrid gloss enhancer and sealant in one. Use White Light on your white or light colored car to enhance bright shine. deep-wet luster, and add durable protection against the elements. 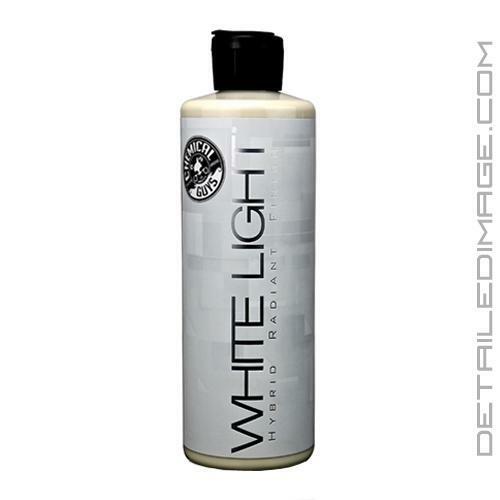 White Light uses premium ingredients that penetrate deep uses premium ingredients that penetrate deep to reduce the visibility of minor swirls and scratches. White Light was developed using a fully synthetic nano-blend formulation enriched with advanced gloss enhancers. The innovative formula cleans light colored paintwork to remove yellowing and discoloration. UV solar blockers protect light colored paintwork for the brightest shine. The unique gloss enhancer can be used by hand or machine. Chemical Guys proprietary blending technology allows White Light to deliver a slick radiant finish unlike anything else. Hand Application: Pour a small amount onto a foam or microfiber applicator pad. Apply to the entire vehicle a thin, even coat. Allow White Light to bond with surfaces for 15 minutes. Buff off with a premium microfiber towel. Once removed, allow 30 minutes of cure time before adding a second coat if desired. Follow with Chemical Guys White Wax for a brilliant shine and durable protection. Machine Applicator: Spread White Light with a dual action polisher using a clean finishing foam pad. Work at a speed no greater than 4 and do not apply pressure. Spread over the entire vehicle in a thin, even coat. Allow White Light to bond with surfaces for 15 minutes. Buff off with a premium microfiber towel. Once removed, allow 30 minutes of cure time before adding a second coat if desired. Follow with Chemical Guys White Wax for a brilliant shine and durable protection. I've added on a second layer. No noticeable difference from 1 coat in terms of bringing out the white pearl color so I'm thinking it was brought out to its best when applied the first time. It's much easier to put on the Avalon this time, and just as easy to remove with a MF towel. Looks real good. I decided to top it all off with Menzerna Powerlock, and finish it with Dodo Juice White Diamond as the LSP mainly for extended protection. I'm relatively new to the detailing world. I've had to research various articles and guides on proper car care and multiple perspectives on how things should be done. So consider my review with this in mind. Goal: 1) Keep white paint from yellowing; 2) Make the car really bright; 3) Ultimate goal = enhance the pearl effect as much as possible. Ease of use: easy on and off. Well, easy off in that it wipes off easily. Not as easy to see though on white without the right angle of light. Method: Water rinse, CG's Citrus Wash (foam gun), foam gun mitt (water bucket for mitt cleaning), rinse, Meguiar's clay kit with Nanoskin Glide lubricant, rewash, dry, CG White Light applied by hand. Claying and applying White Light were done in the garage; washes were done outside. This was done last weekend. I wanted to add another layer but will have to wait until next week and hopefully not longer. Planning to add Powerlock layer and finish off with Dodo Juice White Diamond wax. So onto CG White Light Hybrid. This actually lightened up my bumpers a bit, not by much. In fact, the car looks a little lighter than when I first drove it off the lot. Makes me really excited to add another layer and see where that goes. As for the slickness, it's starting to disappear after a week but the shine is still coming off pretty well. If anything, the dust is just in the way. If there were any cons, it would be that it's somewhat difficult to see where I've applied the product. I would say to make sure you have an additional light source like a flashlight, or just have adequate lighting available. Very nice. Used this after the VSS on my white truck. I am a newbie, but bought me a DA polisher and watched some how to video's and it is amazing how this works on my white truck.